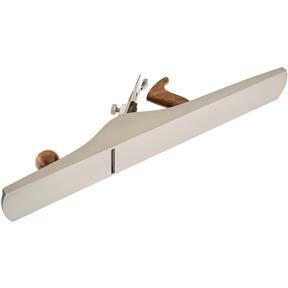 Used for final finishing work, this Plane has a perfectly flat sole that will smooth any wood surface. 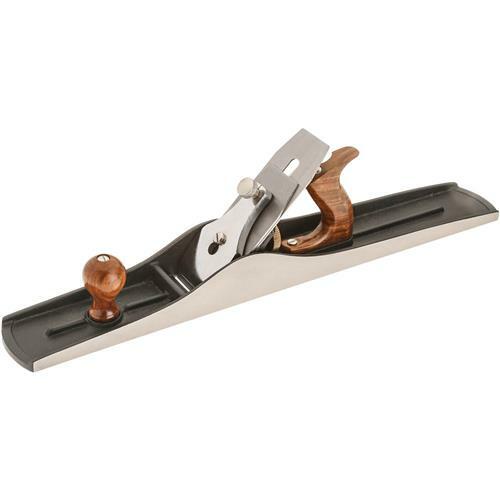 Features include a hardwood handle and knob, full plane iron adjustment, cast iron base, frog and lever caps, chip breakers and knurled brass adjusting nut. Beautifully made with precision fit and finish. Good body, chip breaker kept clogging, replaced with a jock blade and breaker. This plane requires some work to make it functional. The quality is poor in that the frog casting had clinkers that not been cleaned up resulting in the attachment screws being restricted from allowing the frog to be set properly. Also it has a useless adjusting screw that was intended to adjust the frog that was so poorly machined that I just discarded it. And the cap iron is thin, warped, and needed considerably work to get it serviceable. Also the iron had a low corner on the back that took much effort to flatten out. The sole however was dead flat and the sides of the tool were square to it. 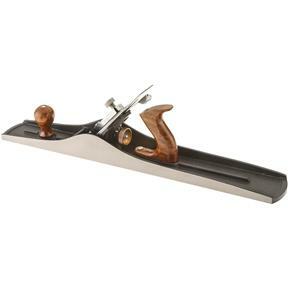 I would not recommend this plane to a beginning woodworker, but if you have the skills to tune it up you will be rewarded with a very useful tool at a much more affordable price than anything else I could find. Most of the reviews I read suggested buying a quality iron and cap iron. That would surely be nice, but in my view not a requirement. Great plane. Appears to be equivalent size of a no. 7. After a bit of honing it produced smooth continuous shavings. Should hold up well. Flat sole and perpendicular sides. I am pleased with this hand plane from Grizzly. I received this plane last winter and used it for the first time yesterday. I was very surprised by the build quality of the tool. The handles and hardware fit well and came set correctly from the factory. The paint and metal castings were all of excellent quality. I didn't fully remove the frog from it's mounted location but the top measured flat. The chip breaker was flat across the blade iron with no gaps. After examining the plane I got out my DMT coarse/fine diamond plates and honed the blade, followed by a 1000/3000 grit water stone and then green honing polish and a strop. The blade honed well and it's cutting edge was 90 degrees to the length of the iron from the factory. Within 30 minutes of starting to sharpen the tool it was ready to be tested on wood. I put it to work on some walnut and maple boards that I had ripped for a build requiring very flat edges. This tool did the trick, it got rid of my TS blade marks and squared up the edges nicely. The weight of the tool seemed appropriate for it's use. I noticed that the lateral adjustment may not have quite as much adjust ability as my other planes (No 4 and 5) but it was never a problem for me. All in all, this was an excellent bargain compared to any used metal jointer planes I saw and was much more useful and adjustable than any wood ones I had come across at a similar or cheaper price. I'm glad I purchased this tool. Chip breaker not machined correctly. Leading edge of chip breaker has an edge angled perpendicular to back of blade rather than sitting flush. It causes plane to gum up. Must rework the chip breaker or buy a better one. Other than that, the plane is good overall for the price. Very well made from good materials, the blade holds a good edge once it has been set up. This plane is the same as the Stanley #7 plane. The plane I got had a flat bottom and the sides were a perfect 90 degrees. For around 70 dollars this was a great buy. The blade and chip breaker needed to be upgraded, I went with the Hock blade and Chip breaker and this put the plane performance over the top. This now performs as good as the best planes on the market. I've been watching for a #7 but didn't want to pay the prices for either new or good old planes. Saw some good reviews for this one and haven't been disappointed. As best I can tell, the sole is perfectly flat and straight, although not square to the sides (I don't plan to use it for shooting, so that doesn't matter to me). It took a bit to flatten the back of the cutting iron, but the Charlesworth ruler trick worked well. A few more minutes on the diamond stones and a strop produced a good sharp edge. I haven't used it enough yet to comment on how well the edge holds up. The adjustments work well, and I like this style of "lever cap" with a thumbscrew rather than a cammed lever. This plane will straighten an edge perfectly. I'm very pleased, especially at this kind of price. I am very happy with this plane. Customer service was great as well. Based on the price, I give five star rating. 1. Sole is flat. So, very very thin shaves can be easily achieved. 2. Very easy to adjust blade depth during planing. 4. The blade is little bit soft. After I replace the blade, the plane works like a premium one.